In recent years, sustainability concept has become the common interest of numerous disciplines. The reason for this popularity is to perform the sustainable development. The Concept of Green Architecture, also known as "sustainable architecture" or green building," is the theory, science and style of buildings designed and constructed in accordance with environmentally friendly principles. Green architecture strives to minimize the number of resources consumed in the building's construction, use and operation, as well as curtailing the harm done to the environment through the emission, pollution and waste of its components. To design, construct, operate and maintain buildings energy, water and new materials are utilized as well as amounts of waste causing negative effects to health and environment is generated. In order to limit these effects and design environmentally sound and resource efficient buildings; "green building systems" must be introduced, clarified, understood and practiced. This paper aims at highlighting these difficult and complex issues of sustainability which encompass the scope of almost every aspect of human life. Keywords: Green-building systems; sustainable buildings; natural buildings; living architecture; renewable resources; eco-design; eco-friendly architecture; earth-friendly architecture; environmental architecture; natural architecture. And, socially, green buildings are meant to be beautiful and cause only minimal strain on the local infrastructure. The buildings in which we live, work, and play protect us from nature's extremes, yet they also affect our health and environment in countless ways. As the environmental impact of buildings becomes more apparent, a new field called "green building" is gaining momentum.Green, or sustainable, building is the practice of creating and using healthier and more resourceefficient models of construction, renovation, operation, maintenance and demolition (Roy,2008). Green architecture, or green design, is an approach to building that minimizes harmful effects on human health and the environment. The "green" architect or designer attempts to safeguard air, water, and earth by choosing eco-friendly building materials and construction practices (Roy,2008). While most green buildings do not have all of these features, the highest goal of green architecture is to be fully sustainable. Also Known As: Sustainable development, eco-design, eco-friendly architecture, earth-friendly architecture, environmental architecture, natural architecture (USGBC, 2002). 1. General overview on applying Green Architecture as a concept of sustainability. 2. Defining Considerations for Green Building. 3. Defining the benefits of applying criteria for Green Building strategies that could maximize energy efficiency, and indoor air quality. 4. Describing case Study potentials in terms of Green Building aspects. Consider site development to reduce the impact of development on the natural environment. For example, orient the buildings to take advantage of solar access, shading and wind patterns that will lessen heating and cooling loads. Carefully select materials that are durable, contain recycled content, and are locally manufactured to reduce negative environmental impacts. A growing market exists of quality recycled products at affordable prices. Incorporate energy-efficient design into buildings to create an efficient and comfortable environment. Take advantage of the natural elements and technologies to conserve resources and increase occupant comfort/productivity while lowering long-term operational costs and pollutants (CBFEE, 1999). Design for high indoor air quality to promote occupant health and productivity. Minimize the waste in construction and demolition processes by recovering materials and reusing or recycling those (CGB, 2009). The green building design process begins with an intimate understanding of the site in all its beauties and complexities. An ecological approach to design aims to integrate the systems being introduced with the existing on-site ecological functions performed by Mother Nature. These ecological functions provide habitat, respond to the movements of the sun, purify the air as well as catch, filter and store water. Designers can create features in their buildings that mimic the functions of particular eco-systems. Species that thrive in natural ecosystems may also utilize habitats created in man-made structures. Creating new habitat on structures in urbanized areas is especially important to support bio-diversity and a healthy ecosystem (Thomas, 2009). The following points summarize key principles, strategies and technologies which are associated with the five major elements of green building design which are: Sustainable Site Design; Water Conservation and Quality; Energy and Environment; Indoor Environmental Quality; and Conservation of Materials and Resources. This information supports of the use of the USGBC LEED Green Building Rating System, but focuses on principles and strategies rather than specific solutions or technologies, which are often site specific and will vary from project to project (USGBC). Fig.1: Elements of green building design by author (USGBC). Water - often called the source of life - can be captured, stored, filtered, and reused. It provides a valuable resource to be celebrated in the process of green building design. According to Art Ludwig in Create an Oasis out of Greywater, only about 6% of the water we use is for drinking. There is no need to use potable water for irrigation or sewage. The Green Building Design course introduces methods of rainwater harvesting, grey water systems, and living pools (BCKL, 2009). The protection and conservation of water throughout the life of a building may be accomplished by designing for dual plumbing that recycles water in toilet flushing or by using water for washing of the cars. Waste-water may be minimized by utilizing water conserving fixtures such as ultra-low flush toilets and low-flow shower heads. Bidets help eliminate the use of toilet paper, reducing sewer traffic and increasing possibilities of re-using water on-site. Point of use water treatment (fig5) and heating improves both water quality and energy efficiency while reducing the amount of water in circulation. The use of non-sewage and greywater for on-site use such as site-irrigation will minimize demands on the local aquifer (Stephen & Harrell, 2008). A natural building involves a range of building systems and materials that place major emphasis on sustainability. Ways of achieving sustainability through natural building focus on durability and the use of minimally processed, plentiful or renewable resources, as well as those that, while recycled or salvaged, produce healthy living environments and maintain indoor air quality. Natural building tends to rely on human labor, more than technology. As Michael G. Smith observes, it depends on "local ecology, geology and climate; on the character of the particular building site, and on the needs and personalities of the builders and users (Smith, 2002). The basis of natural building is the need to lessen the environmental impact of buildings and other supporting systems, without sacrificing comfort or health. To be more sustainable, natural building uses primarily abundantly available, renewable, reused or recycled materials. The use of rapidly renewable materials is increasingly a focus. In addition to relying on natural building materials, the emphasis on the architectural design is heightened. The orientation of a building, the utilization of local climate and site conditions, the emphasis on natural ventilation through design, fundamentally lessen operational costs and positively impact the environmental. Building compactly and minimizing the ecological footprint is common, as are on-site handling of energy acquisition, on-site water capture, alternate sewage treatment and water reuse (Smith, 2002). 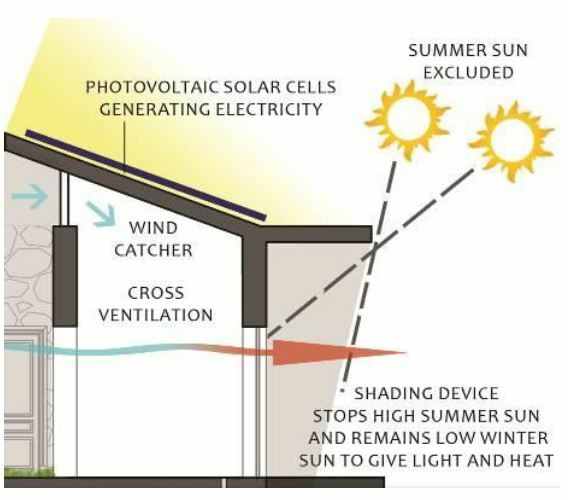 Passive solar design refers to the use of the sun’s energy for the heating and cooling of living spaces. The building itself or some element f it takes advantage of natural energy characteristics in its materials to absorb and radiate the heat created by exposure to the sun. 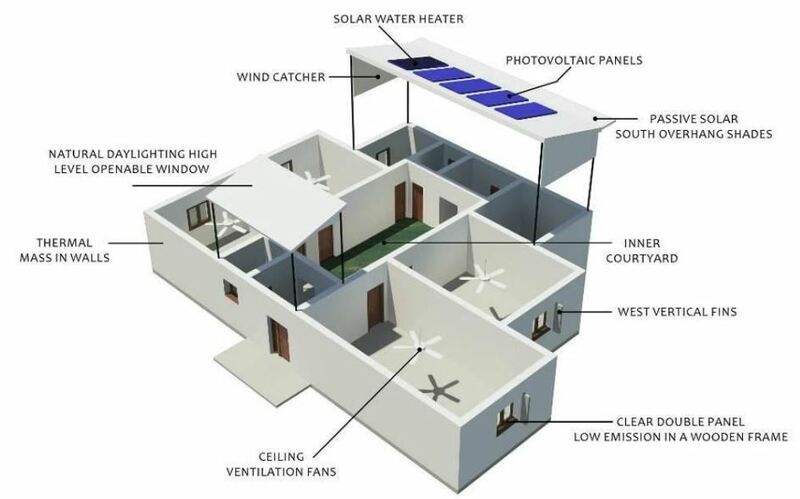 Passive systems are simple, have few moving parts and no mechanical systems, require minimal maintenance and can decrease, or even eliminate, heating and cooling costs (BCKL, 2009). Shape and form of buildings. Design of Building plan and section. Thermal insulation and thermal storage of roof. Thermal Insulation and thermal storage of the exterior walls. 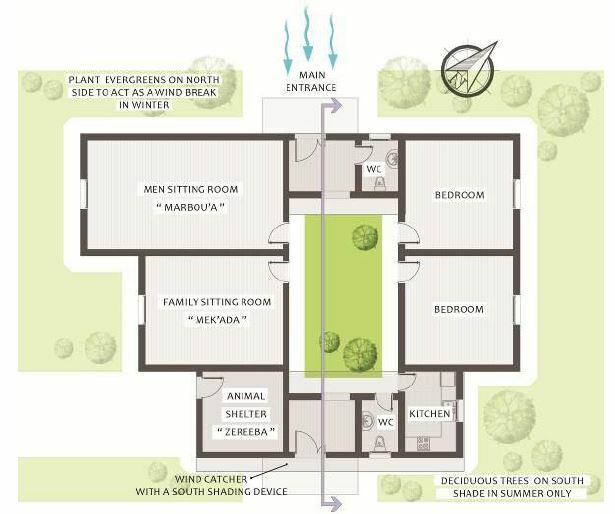 Homes in any climate can take advantage of solar energy by incorporating passive solar design features and decreasing carbon dioxide emissions. Even in cold winters, passive solar design can help cut heating costs and increase comfort (BCKL, 2009). Solar buildings are designed to keep environment comfortable in all seasons without much expenditure on electricity 30 to 40% savings with additional 5 to 10% cost towards passive features. Major Components: Orientation, double glazed windows, window overhangs, thermal storage walls roof, roof painting, Ventilation, evaporation, day lighting, construction material etc. Designs depend on direction & intensity of Sun & wind, ambient temp., humidity etc. Different designs for different climatic zones. Green building materials are generally composed of renewable rather than non-renewable resources and are environmentally responsible because their impacts are considered over the life of the product. In addition, green building materials generally result in reduced maintenance and replacement costs over the life of the building, conserve energy, and improve occupant health and productivity. Green building materials can be selected by evaluating characteristics such as reused and recycled content, zero or low off-gassing of harmful air emissions, zero or low toxicity, sustainably and rapidly renewable harvested materials, high recyclability, durability, longevity, and local production (Cullen, 2010). The materials common to many types of natural building are clay and sand. When mixed with water and, usually, straw or another fiber, the mixture may form cob or adobe (clay blocks). Other materials commonly used in natural building are: earth (as rammed earth or earth bag), wood (cordwood or timber frame/post-and-beam), straw, rice-hulls, bamboo and stone. A wide variety of reused or recycled non-toxic materials are common in natural building, including urbanite (salvaged chunks of used concrete), vehicle windscreens and other recycled glass (Woolley , 2006). One-half of the world’s population lives or works in buildings constructed of earth. Straw bale construction is now gaining in popularity and Many jurisdictions in California have adopted the Straw bale Building Code. Green Building Design favors natural building for its local availability, ease of use, lack of toxic ingredients, increased energy efficiency, and aesthetic appeal (NAOHB, 1998). Several other materials are increasingly avoided by many practitioners of this building approach, due to their major negative environmental or health impacts. These include unsustainably harvested wood, toxic wood-preservatives, Portland cement-based mixes, paints and other coatings that off-gas volatile organic compounds (VOCs), and some plastics, particularly polyvinyl chloride (PVC or "vinyl") and those containing harmful plasticizers or hormone-mimicking formulations (Woolley , 2006). The environment like our bodies can metabolize nutrients and waste. Living Architecture focuses on these processes, integrating ecological functions into the buildings to catch, store, and filter water, purify air, and process other nutrients. Living Architecture also addresses biophilia, the documented health benefits associated with being in touch with living systems in the built environment (Susan, 2008). Throughout history greening of outside walls and roofs of buildings has taken place. Reasons for doing so were the increase of insulation (keep cool in summer and keep cold out in winter), improved aesthetics, improved indoor and outdoor climate, reduce the greenhouse gases such as Carbon Dioxide (CO2), Carbon Monoxide (CO) and Nitrogen Dioxide (NO2) as well as increasing ecological values by creating habitats for birds and insects (Sheweka & Magdy, 2011). 1. Intensive roofs, which are thicker, with a minimum depth of 12.8 cm, and can support a wider variety of plants but are heavier and require more maintenance. 2. Extensive roofs, which are shallow, ranging in depth from 2 cm to 12.7 cm, lighter than intensive green roofs, and require minimal maintenance (Volder, 2014). The term green roof may also be used to indicate roofs that use some form of green technology, such as a cool roof, a roof with solar thermal collectors or photovoltaic panels. Green roofs are also referred to as eco-roofs, vegetated roofs, living roofs, green roofs and VCPH (Wilmers, 1990). (Horizontal Vegetated Complex Partitions). Also known as vertical greenery is actually introducing plants onto the building façade. Comparing to green roof, green walls can cover more exposed hard surfaces in the built environment where skyscrapers are the predominant building style (Jonathan, 2003). According to Ken (Ken,2008), if a skyscraper has a plant ratio of one to seven, and then the façade area is equivalent to almost three times the area. So, if the building is covered two thirds of the façade, this have contributed to doubling the extend of vegetation on site. So a skyscraper can become green, thus increasing the organic mass on the site (Wilmers, 1990). The green walls can be divided into three fundamental types according to the species of the plants; types of growing media and construction method. 1. Wall-climbing Green wall is the very common and traditional green walls method. Although it is a time consuming process, climbing plants can cover the walls of building naturally. Sometimes they are grown upwards with the help of a trellis or other supporting systems (Wilmers, 1990). 2. Hanging-down Green Wall is also another popular approach for green walls. It can easily form a complete vertical green belt on a multi-story building through planting at every story compare to the wall-climbing type (Wilmers, 1990). Aesthetics. Passive solar buildings can have a conventional appearance on the outside, and the passive solar features make them bright and pleasant inside. Environmentally responsible. Passive solar homes can significantly cut use of heating fuel and electricity used for lighting. If passive cooling strategies are used in the design, summer air conditioning costs can be reduced as well (Woolley , 2006). 6.1. Localized Indigenous Knowledge (IK). In addition to IK, Development professionals treasure this local knowledge, finding it extremely useful in solving complex problems of health, agriculture, education, and the environment, both in developed and in developing countries, enhancing the ways that knowledge has been adapted, applied, and disseminated. 1. Courtyard. Courtyard homes are more prevalent in the study area, as an open central court can be an important aid to cooling house in warm weather. Courtyard draws fresh air down through the wind catch. The comforts offered by a courtyard-air, light, privacy, security, and tranquility - provides the shadows are properties nearly universally desired in human housing. Courtyard used for many purposes including cooking, sleeping, working, playing, gardening, and even places to keep animals. 2.Thickness of stone walls. The walls are designed to provide insulation, sunlight filters through increase wall thickness (40-50 cm). 3. Roof. It is placed a mixture of sand and lime mortar above the linoleum protect the bishop from the impact of the sun's heat and reduces the permeability of water falling from the rain in the winter. This study produced prototype referred to as Typical Housing Prototype (THP) which is built with a central courtyard, singlestory two bedrooms. The plan of the prototype is shown in Fig.3 below. Features were considered to optimize the integration of passive design strategies. Building orientation determines the amount of solar radiation it receives. In addition to other elements such as Evergreen trees were planted on north side to act as a wind break in winter, while deciduous trees on south side to shade in summer only. Courtyard design. The central courtyard allows spaces for relaxation and interaction of occupants keeping their activities away from neighbors in addition to passive cooling strategies. It achieves enough daylight penetration, reduces solar heat and promotes cooling breezes while keeping out hot and dusty wind. Sun angles and Shadings. The design doesn’t oversize the amount of south-facing windows as oversizing can lead to overheating. Horizontal exterior overhangs are used on the south side of the building to block direct summer sun. Ideal proportions for an overhang are calculated by latitude (Alexandria, 31.2000° N).The overhang is large enough to block summer sun, but doesn’t block sun in winter. Thermal Mass. The walls of the house are thick and massive. The high-mass walls are cooled from the cool night time temperatures. In turn, the walls then cool the occupants during the day by accepting the heat radiating from their bodies. Walls: Solid 8" Masonry wall which could be double wall for maximizing thermal mass. Roof Construction: Flat light weight concrete (20 cm) and plaster (1 cm). Floor: Slab on Grade covered by carpet or casework. Rain water harvesting. The roof of the building consists of gutters or pipes that deliver rainwater falling on the rooftop to the storage tank. Harvested water can be used for toilet flushing and garden irrigation. Aquifer Water. Well pumps are built to be used for extracting water from an underground source. Biogas Plant production. Biogas is one of many renewable energy systems that provide greater independence at very low cost. Produced gas from anaerobic digestion of organic material will usually be piped from the top of the tank to a biogas cooking stove and/or biogas lights. Photovoltaic (PV array). Photovoltaic panels are installed on south-facing roof which is inclined with an angle to maximize the amount of electricity produced. Solar domestic hot water. Solar hot water systems are used to collect energy from the sun in panels or tubes to produce domestic hot water used in the house. Principles of Green Architecture are: Water features and their management; natural building design; passive solar design; green building materials; living Architecture. These principles are applied in a sustainable fashion to achieve an eco- friendly building. Any architect has the ability to change an entire building process by specifying materials with low carbon dioxide emissions. Green building standards are available for almost every type of building on a global basis and these standards are well developed and are regularly being updated; they cover all phases of a building’s life cycle from design through demolition. Buildings that have been designed according to sustainability standards need to be operated and maintained according to these same standards. Buildings that were built prior to enacting these sustainability standards can also be upgraded to meet the standards that have subsequently been put in place. Green buildings must have a number of common components: these include a focus on energy efficiency and, in some cases, renewable energy; the efficient use of water; the use of environmentally desirable building materials and specifications; a minimization of the waste and toxic chemicals generated in the building's construction and operations; good indoor air quality; and an eye on so-called "smart" growth and sustainable development. Green architecture produces environmental, social and economic benefits. Environmentally, green architecture helps reduce pollution, conserve natural resources and prevent environmental degradation. Economically, it reduces the amount of money that the building's operators have to spend on water and energy and improves the productivity of those using the facility. And, socially, green buildings are meant to be beautiful and cause only minimal strain on the local infrastructure. Traditional building materials are to be adapted to meet code-required standards for health and safety in contemporary buildings. Not only are they cost effective and environmentally friendly, but, when used correctly, these natural alternatives match the strength and durability of many mainstream construction materials. New building technologies, and in particular ICT automation and new materials, are to constantly be introduced to enhance the sustainable building process with the goal of reducing the impact of the building on the surrounding environment by using resources more efficiently (e.g. energy, water); enhancing and protecting the health and well-being of the occupants; and reducing any negative impacts.